The Ping Anser G5i would certainly not win prizes in any beauty contests. It looks like a regular Ping Anser with a strange growth sticking out of the back of it. Why the designers at Ping put it there, I have no idea. Is it to help you scoop your ball up after being so distracted by the ugliness of the club in your hand that you missed your putt? Then there's the matter of the blue plastic - the insert on the face is blue and there are several blue bits you see behind the face when you address the ball. I'm afraid that to my eye it looks cheap, cheap, cheap. To top things off there are holes cut through the base of the putter so you see the grass beneath. All very odd. This putter also seems to have a lot of loft on its face - looks to me like more than the 4 degrees of loft that Ping generally puts on its models. I don't know whether it is just the blue colour of the insert that makes you notice the loft more, or whether it actually has more loft. Either way it might take a bit of getting used to. Having got over the look of it, the putter actually felt wonderful. I have to take back everything I said about this putter - it's quite simply brilliant. The response through the (still hideous) blue insert was firm and seemed to conduct the feel of the strike beautifully. The roll was terrific as well. I don't think I've ever been so surprised by the results I got with a putter. After dreadful first impressions, I was soon wondering where I could get my hands on a Ping Anser G5i. Putting guru, Stan Utley, says that having a little more loft on your putter will roll the ball truer and will make you putt better. Perhaps this is the reason why the roll was so good, either way it was genuinely good. A clear case of an ugly duckling that turns into a beautiful swan when you take it onto the green. 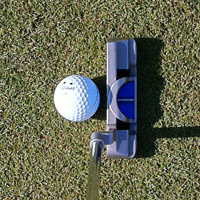 If all you're interested in is making more putts, then the looks are probably worth it!